Be the first to share your favorite memory, photo or story of Carol . This memorial page is dedicated for family, friends and future generations to celebrate the life of their loved one. 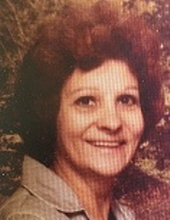 Carol L. Dones, 85, of Moline, passed away March 19, 2017, at Genesis Medical Center, Silvis. As she wished, cremation rites will be accorded. Quad Cities Cremation Center is assisting the family with arrangements. No memorial service is planned. Carol was born Dec. 4, 1931, in Marquette, Iowa, nicknamed Pepper, the daughter of William and Louise McClintock Herzmann. Carol was a longtime employee of Trinity Medical Center and Home Care. She enjoyed a good cup of coffee and family time; at other times you could find her reading books or writing letters and sending cards to family. She also enjoyed shopping for bargains, watching westerns, gardening, baking pies and creating other family favorites such as fried green tomatoes. Her door was always open with good food and plenty of memories. Survivors include her children, Bernice Helms, Sandy Perez, Clyde Lessard, Elaine Caldwell, Cindy Dooley, Tina Wilkinson, Anita Nichols, Chris Lessard, Rodney Schleeter and Katrinia Frost; 26 grandchildren; 40 great-grandchildren; brothers, Gene and William Herzmann; and she shared her home with granddaughter, Kristi Schleeter. Carol was preceded in death by her parents; children, Robin, Christine, Russell and Larry Lessard; three grandchildren; one great-grandchild; brother, John Herzmann; sister, Neoma Lessard; husbands, Clyde Lessard, Lesley Schleeter and Willie Dones. We will miss you mom, every day. To plant a tree in memory of Carol L Dones, please visit our Tribute Store. "Email Address" would like to share the life celebration of Carol L Dones. Click on the "link" to go to share a favorite memory or leave a condolence message for the family.